The Turkic languages are spoken over a large geographical area in Europe and Asia. It is spoken in the Azeri, the Türkmen, the Tartar, the Uzbek, the Baskurti, the Nogay, the Kyrgyz, the Kazakh, the Yakuti, the Cuvas and other dialects. Turkish belongs to the Altaic branch of the Ural-Altaic family of languages, and thus is closely related to Mongolian, Manchu-Tungus, Korean, and perhaps Japanese. Some scholars have maintained that these resemblances are not fundamental, but rather the result of borrowings, however comparative Altaistic studies in recent years demonstrate that the languages we have listed all go back to a common Ur-Altaic. The outstanding characteristic in the evolution of the written language during these periods was that terminology of foreign origin was accompanied with the indigenous. Furthermore, during the 14th and 15th centuries translations were made particularly in the fields of medicine, botany, astronomy, mathematics and Islamic studies, which promoted the introduction of a great number of scientific terms of foreign origin into written Turkish, either in their authentic form or with Turkish transcriptions. Scientific treatises made use of both written and vernacular Turkish, but the scientific terms were generally of foreign origin, particularly Arabic. The most significant characteristic with respect to the Turkish language was the tendency to eliminate foreign vocabulary from Turkish. In the years of the reformation, the number of newspaper, magazines and periodicals increased and accordingly the need to purify the language became apparent. The writing of Namik Kemal, Ali Suavi, Ziya Pasa, Ahmet Mithat Efendi and Semsettin Sami, which appeared in various newspapers, tackled the problem of simplification. Efforts aimed at "Turkification" of the language by scholars like Ziya Gökalp became even more intensive at the beginning of the 20th century. Furthermore, during the reform period of 1839, emphasis was on theoretical linguistics whereas during the second constitutional period it was on the implementation and use of the new trend. Consequently new linguists published successful examples of the purified language in the periodical "Genç Kalemler" (Young Writers). At present, in conformity with the relevant provision of the 1982 Constitution, the Turkish Language Association continues to function within the organizational framework of the Atatürk High Institution of Culture, Language and History. The essential outcome of the developments of the last 50-60 years is that whereas before 1932 the use of authentic Turkish words in written texts was 35-40 percent, this figure has risen to 75-80 percent in recent years. 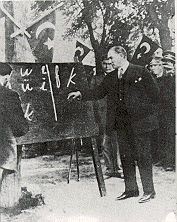 This is concrete proof that Atatürk's language revolution gained the full support of public. Some selected references are provided below for further reading.